Red Stocking volunteer gift wrappers Sarah Henderson and Marcie Nichols in elf mode. 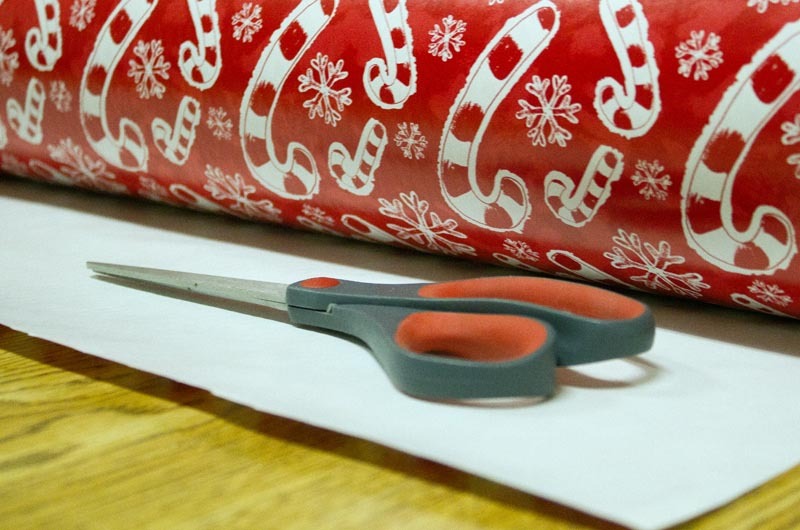 Holiday music played softly in the basement hall of St. Augustine Church in Vineyard Haven as scissors snipped wrapping paper and pens and pencils scribbled notes. 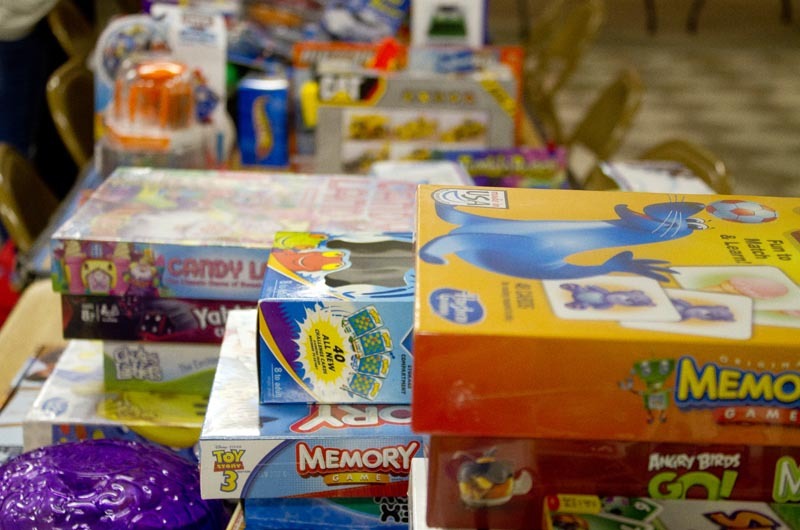 One table was piled with stuffed animals of every color, another held knit hats, and another was stacked with board games, toy cars, Frozen dolls, and science experiments. The basement hall might well be Santa’s workshop Monday morning, except that Santa is in this case not a jolly man in a red suit but a group of dedicated volunteers who come together each year with one goal: provide children in need with gifts for Christmas. St. Augustine is home base this year for the Red Stocking Fund. The program was established in 1938 and has grown considerably from the first six stockings that were filled. This year, more than 300 children (ages newborn to eighth grade), will receive gifts. Their holiday wishes, submitted by parents, are listed on large pieces of paper and taped along one wall of the basement hall. But unlike Santa’s list, there were no names written down. All Red Stocking applications are anonymous; gifts and recipients are matched up using a number system. “This is hard for people, to ask for help,” said Susie Wallo, who is co-chairing the program for the first time this year. She is joined by Leslie Frizzell. The two took on the task after veterans Kerry Alley and Lorraine Clark “retired” after 20 years. Mr. Alley and Mrs. Clark are still involved, however; it’s hard to stay away from such a good cause. Mrs. Frizzell said this year’s volunteer corps is a mix of longtime wrappers and shoppers and newcomers. “The next generation’s here,” she said. Mrs. Wallo said that many times when Red Stocking parents get back on their feet, they in turn become volunteers for the program. Applications for the Red Stocking Fund go out at the end of October, and begin to trickle back in soon after. Shoppers begin their work at on-Island stores like Brickman’s and Basics. “We try to do that, to put the money back into the community,” Mrs. Wallo said. Every recipient gets a hat and mittens, as well as pajamas, underwear, and socks. Everyone receives a food gift certificate or a box of food (the Edgartown School prepares the boxes). Everyone gets a book. And everyone gets art supplies of some sort. Stores offer discounts for Red Stocking shoppers, and many donate items to the cause. The Harley Riders will hold their second collection drive of the year today. This weekend, the Oak Bluffs fire and ambulance department hosted a Stuff-an-Ambulance event and collected more than 200 toys. 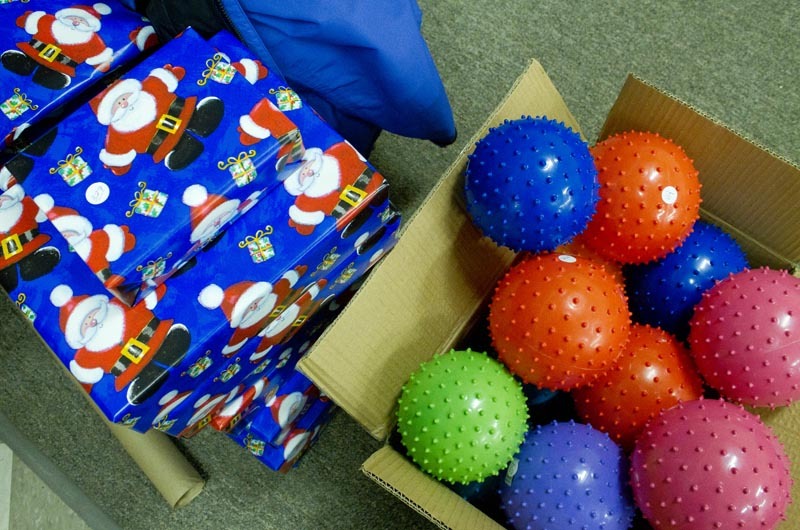 The gifts were added to the department’s 100-toy contribution from last year, which came in too late to be part of the 2014 gift-giving. The toys waited out the year in Mrs. Frizzell’s daughter’s bedroom. “I feel like the Island just opens up,” said volunteer Susan Shea, who was sorting through boxes of Crayola colored pencils and washable markers. 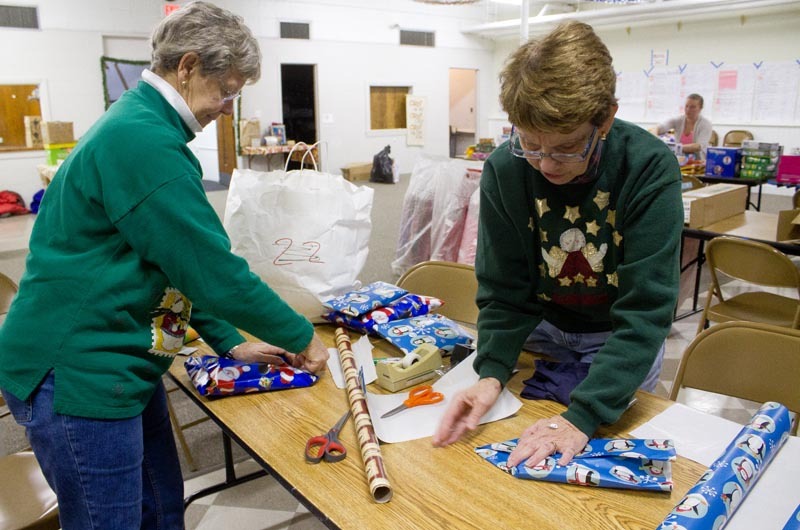 Red Stocking volunteers will be wrapping gifts at St. Augustine Church in Vineyard Haven on Tuesday and Wednesday from 9 a.m. until 3:30 p.m., and on Tuesday evening from 5 p.m. until 8 p.m. For more information, call Susie Wallo at 508-776-6050 or Leslie Frizzell at 508-523-1373. So nice to see our community come together to help those in need. I couldn't get over the Oak Bluffs firemen who stood out in the pouring rain and heavy wind for six hours straight last Saturday!! What a dedicated crew! Solid work OB Fire Department!! It’s time for the Red Stocking Fund Drive, brought to you by the Martha’s Vineyard Harley Riders. Red Stocking applications are now available at several locations.